If the sun is shining, Clara and I can usually be found around the garden, puttering and prepping the raised beds for winter. On that particular day, the sight of the curly green kale was enough to get me thinking about a salad for lunch, and after an hour or so of work, we were both ravenous. Kale doesn’t mind the cooler temperatures that have arrived to our homestead and all across Quebec. In fact, the cold nights only make it all the sweeter. Clara snapped off a big bundle of stalks while I nipped indoors to fetch a bowl, a knife and a tiny jar of vinaigrette I had in the fridge. We already had a few apples and a jar of toasted pumpkin seeds out on the picnic table that we had been snacking on in the morning. I found a knob of parmesan and brought that out to the garden too. Then we made lunch. Clara tore the kale off the stalks and I massaged the dressing into the kale. Side note: you know that any and all raw kale salads NEED to be massaged, right? It breaks down the tough fibers and brings out the sweetness in the kale, transforming it into a tender (and more digestible) salad green. I think I need to be really clear on this one. You wouldn’t make a pasta dish without first cooking the pasta, right? I mean, who tosses pesto and cheese with raw, crunchy penne and serves it up? No one. Well that is how I feel about freshly dressed leafy green kale salads. Kale salad should not look leafy; it should look dark green, bruised, and almost soggy. Mmm, now we are talking. So from the top, here’s what kale salad prep should look like: wash kale, pat dry, tear off stalk, break or chop into smaller pieces, add a little vinaigrette, get in there with your hands and squeeze the life out of the kale (you can also use two wooden spoons but it isn’t nearly as much fun), dress the salad with additional ingredients, add remaining dressing and serve. For my salad, I add both Honeycrisp and Russet apples to the massaged kale to have both sweet and tart flavours, but you could use any apple (or pears) you have on hand. That is kind of the point of this salad! I tossed everything together with a fresh grating of parmesan cheese and also threw in a little fresh parsley, just because I have so much in my garden. The toasted pumpkin seeds went in last, so that the would stay crisp. If you didn’t hollow out any pumpkins and toast the seeds this year, you can use pepitas in this salad. They are the pale green hulled pumpkin seeds and can be found in the organic section of most grocery stores. 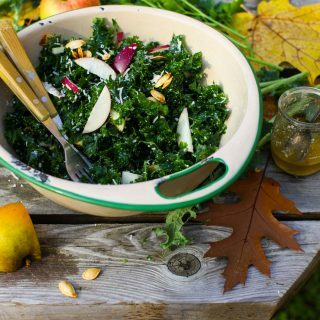 Toasted almonds or pine nuts would also be delicious with the apple and kale. Two forks in the big bowl of salad was the easiest way to enjoy this salad. Who needs to go inside for plates? Not us. 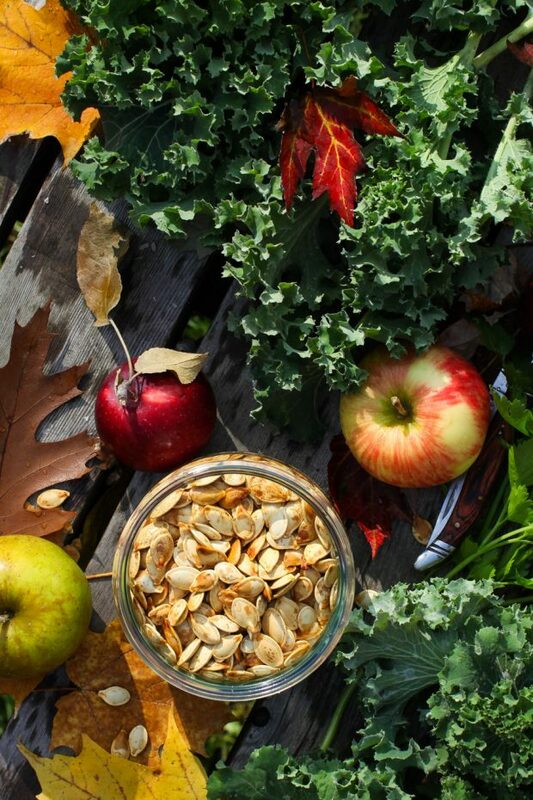 On warm fall afternoons, we need to maximize our hours of Vitamin D and eat lunch right in the garden. 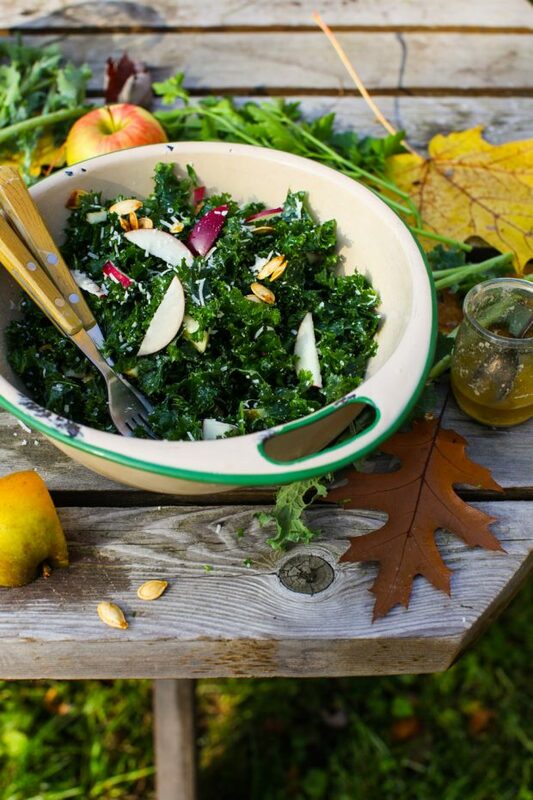 Oh yeah, three cheers for the simplicity of (massaged) kale, tangy apples, salty cheese and crispy pumpkin seeds. Are you salivating yet? This could be my lunch every day this week and I would not complain. In fact, I think I like this plan. Now if I could only guarantee sunshine every day we’d be all set. A simple garden salad, November style. Don't forget to massage the kale. Wash the kale and pat it dry with a clean tea towel. Tear it off the stalks and discard the stalks. Tear or chop the kale into bite-sized pieces and add it to a big bowl. Add a little vinaigrette and massage the kale with both hands until it begins to break down and feel tender. 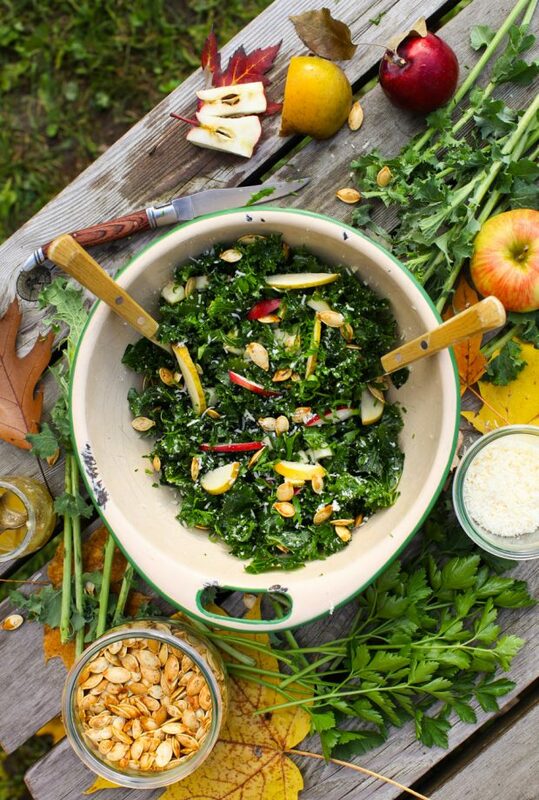 Wash and chop the apples, then toss them in with the kale. Toss with remaining vinaigrette. Sprinkle in the cheese, pumpkin seeds and parsley. Toss and serve at once. Be sure to add the seeds in last so that they maintain their crunch. 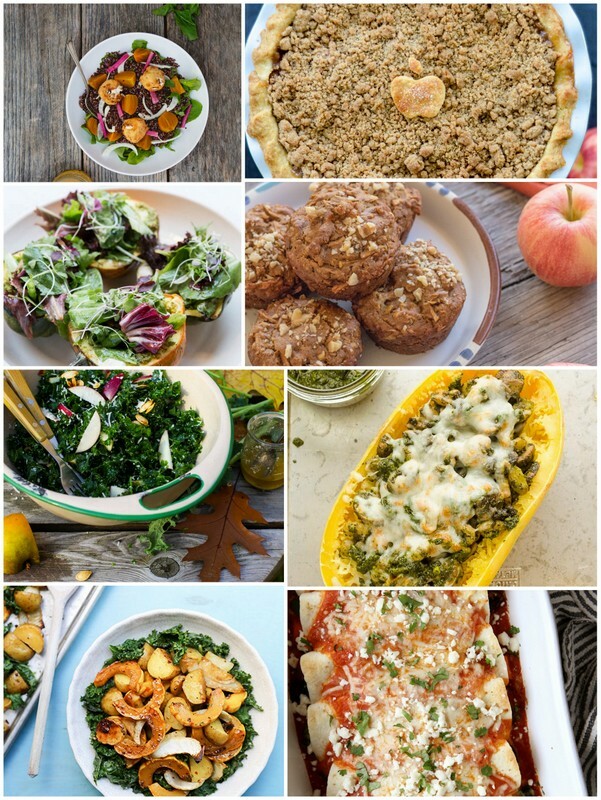 For apples to squash, here’s what else our #EatSeasonal group of bloggers were inspired to cook up for the month of November. Enjoy eating seasonally in November, friends. I always feel like I go overboard with the kale posts too but I just honestly like it and it makes me feel so good! I LOVE the photo of your daughter diving right in! I’m glad to have another kale fan in the room. And yeah, Clara was really into it. I call her my little rabbit – she loves salads a bunch! You can’t beat a salad that’s straight from the garden, and I’ll eat kale any time it’s put in front of me. I don’t think it’s possible to post too much kale! This salad looks amazing and I love seeing your daughter enjoying that salad so much! Mmm that is exactly what I want for lunch now. I love how Clara is diving into it 🙂 that girl knows what is good for her. She certainly has zeal for life – and this salad! Love that picture of Clara! So cute! And love the story as well. Sounds like a wonderful afternoon. I never tired of kale salads, so keep ’em coming! Same here! 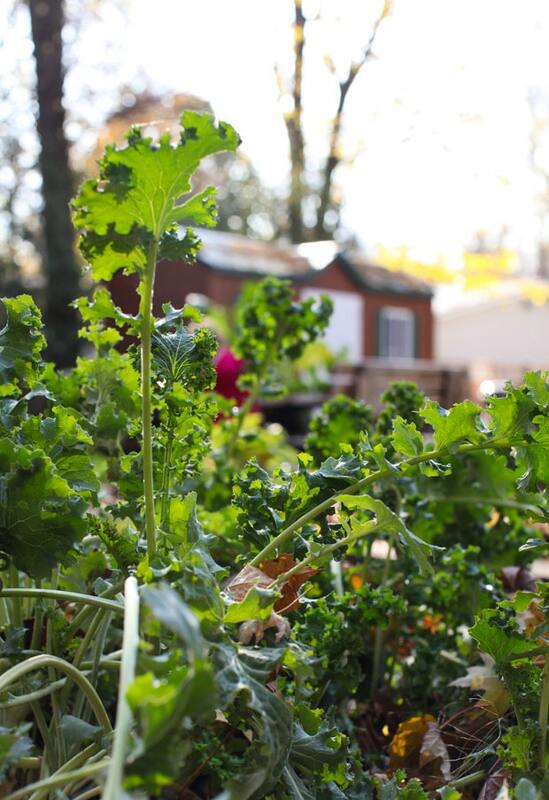 Seems to be a lot of love for kale in November, naturally! I love SO many things about this post! 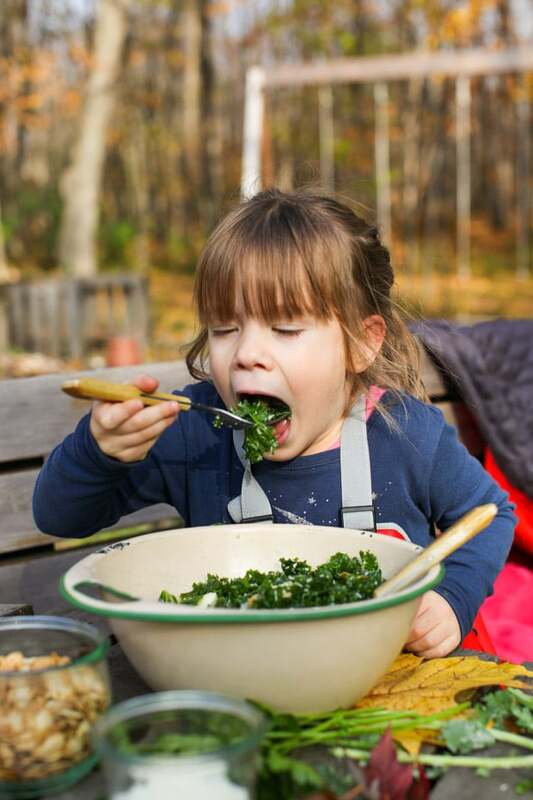 1) eating kale salads with my daughters would be a dream come true! 😉 2) Isn’t it amazing how kale just grows like a weed in the garden!? It’s go great having fresh kale on hand! 3) I’m so glad you mentioned massaging raw kale…even though it sounds funny it’s crucial!!! Thanks for stopping by, Laura. Yes, Clara is my little salad-lover, actually all my kids love green salads. Thanks goodness kale grows like a weed, as you said. I just LOVE how Clara is chowing down on that kale salad! My kind of girl! These are the kinds of posts and recipes that make your blog such a valuable resource, Aimee!